07-17-10 CHASE LOG: MN A moderate risk for severe weather, issued by the Storm Prediction Center, was in place this day across much of MN. A surface low was forecast to move into northeast SD and extreme west-central MN by late in the day while a warm front was draped to the north of I-94 across north-central MN and a cold front into eastern SD. Peggy Willenberg, MaryLynn, and I left the Twin Cities near 1pm and progressed northwest on I-94, targeting an area just to the west of Elbow Lake, MN near the MN/ND/SD border area. Our initial thoughts were to position ourselves just ahead of the triple point that was expected to be near this area by late afternoon, shortly after initiation. However, Mother Nature threw a wrench into things and a very nice supercell developed on the warm front near Sauk Centre, MN and we were in perfect position to intercept the storm near Melrose around 3pm. This storm was already in a highly sheared and unstable environment and soon got its act together, producing a couple of ragged, rotating wall clouds near Melrose and near Oak Township. The storm was already producing a large mesocyclone to the northeast of the wall clouds and this meso was starting to arc and gust out at this point, with a shelf-like feature on the leading edge. After getting cored by this storm and getting hit by nickel sized hail near Oak Township, there were other storms that fired ahead of the stronger supercell. At this point, our main storm had weakened with no wall cloud or lowering visible. Based on what was occurring, we thought the storm was traveling into a “slightly” less favorable environment than what was further west-northwest of our position. The environment that this storm was heading into was still favorable overall to sustain itself and produce tornadoes, but was slightly less favorable as the storm progressed southeast towards the Twin Cities. This storm did end up having beautiful structure upon moving towards the northwest Twin Cities metro and a huge, rotating, gusted out meso. There were a couple of tornado reports from this cell, but I am doubting any tornadoes actually occurred as the reports were suspect, no pictures or video of the “tornadoes” were taken, and the damage that occurred was more coincident with straight line wind damage and hail. After bailing on the storm we traveled up I-94 and then took Hwy 27 west out of Alexandria towards Wheaton. Intense thunderstorms had already developed north of the warm front, near the triple point and along the cold front, with a few of these storms well to our north being tornado and severe warned. New storms began to fire ahead of the initial storms on the triple point and we waited to see what these would do. SB CAPE values at this time were in the 1500-2500 J/kg range with a nose of 3000 J/kg pocking up into southwest MN, while Effective Helicity values were actually in the 300-600 m2/s2 range across this area! This would normally be very supportive of strongly rotating supercells, but it became apparent that the upper trough had arrived at this point, as there were numerous updrafts occurring and the storms were starting to congeal into a big mess with the cloud shield spreading downstream and seeding any new storms that were trying to develop ahead of the forming cluster in SD. We picked a couple of the stronger updrafts and tried to stay ahead, while storms began to go linear by 7pm. There was a nice shelf cloud that we stayed ahead of from Willmar to Delano, where we finally let it overtake us with heavy rain, small hail, and estimated winds up to 45 mph. The storm did bow out through the far northern Twin Cities metro and produce some wind damage through this area after we had ended the chase for the evening. Turbulent sky approaching the supercell near Albany, MN. Looking at the approaching beast of a storm near Albany, MN. 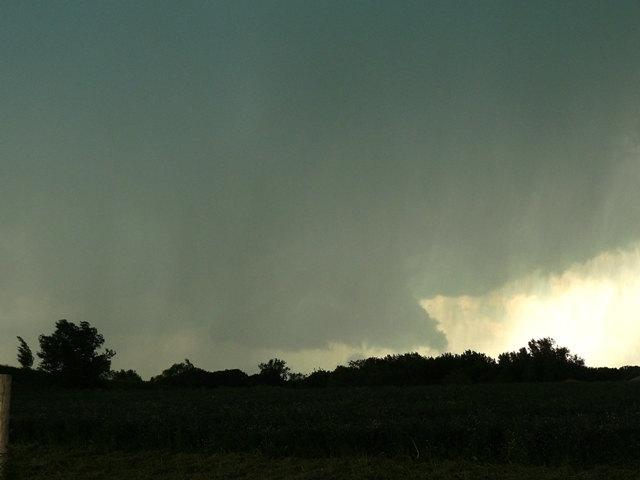 Large mesocyclone underneath the supercell near Melrose, MN. The edge of the mesocyclone and storm base near Melrose, MN. Rotating wall cloud with rising scud into it near I-94 and exit 131. A short time later as the wall cloud was starting to become more blocky and still rotating with rising motion. Very fast rising motion and condensation into the storm base near Meire Grove, MN. 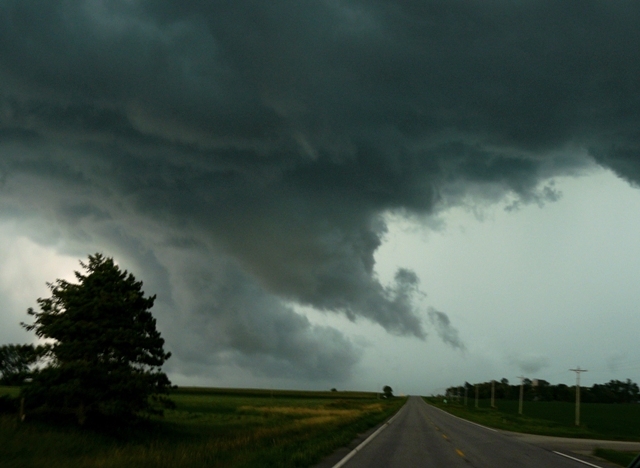 Another wall cloud behind the rain curtain near Grove Township, MN. Mammatus underneath the anvil near New Munich, MN. Leading edge of shelf cloud near Litchfield, MN.